Today Prime Coaching provided a bespoke coaching morning for Islington Cycle Club. Whilst we are happy to tailor our coaching sessions based on a club’s individual requirements, today’s brief was “we’ll have what London Dynamo had”. Fair enough, so here’s what we did. Aidan, from the Islington CC recruited as many as he could from the club, and where numbers were available, padded the session out with riders from the Central London CTC group. On a session like this, more definitely is the merrier to allow us to simulate race scenarios and also keeps cost per rider down. In total, 26 riders made the journey to Hillingdon Cycle Circuit, almost all arriving promptly for the 9:30am start. Those that ventured across town by bicycle were given the opportunity to shed excess equipment, partake in a hot beverage and a biscuit, and introductions were made to identify the Prime Coaching staff for the day – Steve May and Dave George provided the static coaching, with Ralph and Simon Passey, Rachel McKay and Duncan Adamson providing riding coaching, and Julie May fulfilling the most important role of ensuring the kettle was replenished. We started the session with a small pen and paper task. As coaches we like to ensure that all training, coaching and racing is carried out with a predetermined list of goals. In this instance, we asked riders to set three goals to achieve from the session. The checlist and goals form we used is available here. Afterwards, we would refer back to the pre-session goals to determine if they had been met. More on this later…. After that, it was straight onto the circuit for the warm up. Splitting the group into two smaller groups based on ability gave the coaches chance to assess how the riders performed as a “chaingang”, rotating constantly forward “through” a working line before moving “off” to the recovery line. First impressions were good. The lines of riders were straight and tight, but it was evident that a little work was needed to reinforce the techniques that would make a smoother, more controlled ride without accelerations and drop offs. Everyone came off the warm up smiling – a good sign! We then moved onto the first performance exercise – bridging the gap. The riders already have established groupings of A, B and C squads, based on ability. These three groups formed a steady ride at 1/3 lap intervals, with the front two riders expected to accelerate off the front, work together to catch the next group, whereby the next two riders would go off, and so on. Based on the principal that “a rider that is not challenged is a cheated rider” it was evident that the performance aspect was welcomed, enjoyed with just the right amount of challenge. 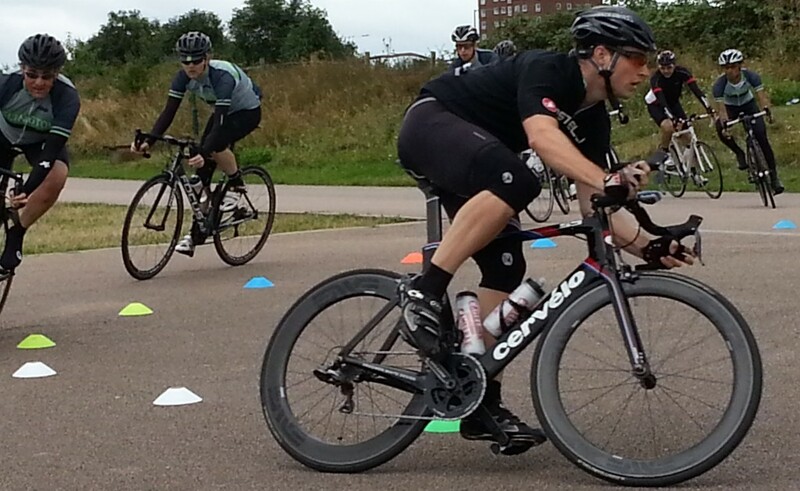 The skills drill of moving through a line of riders safely but assertively and with confidence came next. After that, we were starting to combine skills together. The 4-man-attack scenario that we often use, was extended by Steve to include a tight chicane requiring the riders to regulate their speed through an otherwise straight section of the circuit. Adding the cornering to both the tactical and performance aspects started to add additional challenges to the riders. Leading on from this, we further broke the squads down into sub-teams, and introduced working for a team and pace management into the session. Back in the clubhouse, we went back to see if the pre-session goals had been fulfilled. A very positive response was given and all involved agreed that the session had met expectations. Have Fun – We hope the riders did. We know we did. Drop Jim – We can’t recall Jim, or if indeed he was dropped, but this was a common theme noted as a goal. Jim, you seem to be a marked man! Thanks go Aidan for arranging this, and all the riders who made it happen. Well done! We really enjoy facilitating these sessions, and it is certainly high on the Prime Coaching agenda to get more clubs to attend these and other similar sessions. If you would like to inquire about how we could structure some coaching for your club, team or organisation please do not hesitate to contact Steve May for more details. Loads of fun at Calshot Velodrome this afternoon, brilliant coaching and a fascinating and exhilarating experience. I left with a much greater understanding of track cycling and even more admiration than before for those who do it at the top level. © 2019 Prime Coaching. Built using WordPress and Mesmerize Theme.